Etymology: from Greek " castanea " from Castanis, ancient city of the province of the Pont (currently Turkey). Origin: Middle East, introduced into Cévennes by the Romans. Species : Japanese and Chinese chestnuts. Habitat : light or half shade. The young chestnuts prefer shade. It fears severe cold and does not appreciate the calcareous fields. It fits with poor, sour or sandy soils. It does well in Brittany or in the Massif central. It covers 1,5 % French forests (see the distribution map of the French forest). Hardiness: zone 7 (it supports cold until -15 °). Smooth bark cracked in long, dark brown (old tree). Straight trunk. Angular stems. Deciduous foliage. Leaves alternate, long (20 cm), petiolate, coriaceous, big pointed teeth. 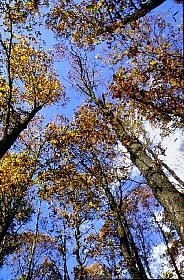 In autumn, leaves pass by a pretty yellow, ephemeral, which turns fast to the brown. As with other Fagaceae (oak, beech), the chestnut tree leaves remain on the tree a part of the winter. They are marcescent. 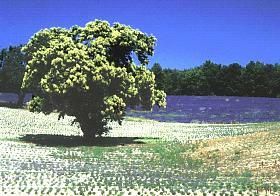 The chestnut blooms in its 20th year. Male flowers in yellow, upright catkins of 12-20 cm, in June-July. Small female flowers, at the base of catkins. Dry fruits (akenes) in a bug: the chestnut. It contains the saponin and the pectin (with antispasmodic effect). Chestnut production is the most important between 40 and 60 years of age of the chestnut. Songs on the chestnut: the chestnut of Jean Ferrat. the Spanish chestnut occupies a broad place in the Encyclopédie ou Dictionnaire raisonné des sciences, des arts et des métiers (written between 1751 and 1772 under the direction of Diderot). Uses: in the past, the poor people harvested chestnuts to make a kind of (indigestible) bread. In Privas (Monts d'Ardèche), confectionery produced "frozen horse chestnuts", in the XVIIIth century. The wood is waterproof and elastic. It is used to make poles, stakes including vineyards, floors, tubs, but also particle board, pulp and paper, basketry, castanets, furniture and paneling. It is also an excellent timber. Its scent repels flies. Thus, spiders do not spin their webs! It is also used for firewood because of its rapid growth and its ability to stump (it grows in clumps). The bark is rich in tanning extracts. Medicinal Properties: plant astringent, febrifuge and haemostatic (bark and wood tannins), diarrhea (catkins dried).